Caulking is a critical element of many interior projects. From sealing gaps around sinks and toilets, to weatherproofing, to interior and exterior painting, caulk is an invaluable product. To make the application process easier, it’s important to choose a quality gun and learn how to use it correctly. It may seem at first that the least expensive caulking gun is the best buy, but that’s not the case. The least expensive versions will tire your hands quickly, waste caulk, and make a mess. Higher-end versions are more enjoyable to use; since caulk has so many applications around the house, it makes sense to invest in something other than the basic model. Basic caulking guns require you to depress a plunger and pull a trigger at the same time to dispense caulk. These are among the cheapest tools available, and you’ll be able to pick one up for under ten dollars. Unfortunately, the plunger continues to exert force on the tube of caulk even after the trigger has been released, so there’s always some oozing. Make sure you have something to set the gun on when you decide to take a break. Even experienced users will find that depressing the trigger all day will cause a sore, even blistered, index finger. Protect it by cutting a finger off an old latex glove to use as a shield. Even at the most basic level, caulking guns can vary widely in quality. Three features can make the difference between a gun that is usable, and one that is so frustrating you just have to throw it away. Look at the plunger rod. There are two types available: smooth and ratcheted. Smooth rods give you the most control. The tube of caulk will need to be opened somehow; many people use a utility knife, but caulk guns with a built in cutter create a more evenly shaped opening and reduce the chances that you’ll cut yourself. Finally, look for a gun that has a built-in wire to clear the tube of clogs. Otherwise, you’ll be poking around with a nail. Professional contractor grade models are built to last and with features the inexpensive alternatives just don’t have. The cost difference between cheap difficult to use models and a good contractor grade gun is only a few dollars. Don’t skimp on quality when so much is riding on a good caulking job. 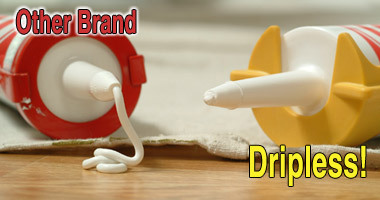 Dripless Design – When the trigger is released the caulking stops flowing. You don’t have to twist the plunger rod or push a button to release the pressure. Seal Punch – Built-in punch tool for caulking products that have an inner foil seal. Cutter – Easily trim the cartridge tip to any desired opening size. Ladder hook – Convenient hook for hanging the caulking gun on a ladder. Open Frame – Less weight without the need for a cradle to hold the tube. Higher Ratio – When the trigger is pulled more thrust is transferred to the shaft. This will produce less hand and wrist fatigue. Battery powered caulking guns are less tiring to use. They vary widely in price; a 10 oz. 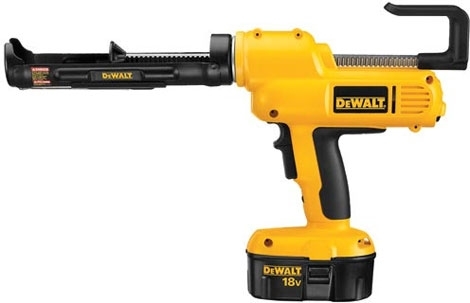 gun powered by double A batteries will set you back about $35. On the higher end, a rechargeable, quart-sized dispenser can cost anywhere from $250 to $600+. For the average homeowner, the 10 oz. gun delivers a good balance between ease of use and efficiency. Leave the more expensive models for the industrial users! Pneumatic caulking guns that connect to an air compressor can be fun to use. Like battery powered models, they are much easier on your hands and are especially good for dispensing very viscous caulk. These, too, vary widely in price, depending on what volume tube you want to insert. Smaller, more basic models designed to house 10 oz. tubes cost $45-$100; fancier versions can cost $475 or more. One thing to keep in mind is that bigger is not always better. There are some types of guns that can hold a large container of caulking, and they may seem to make sense since the larger containers of caulk typically cost less per ounce than the smaller ones. The cost difference will be offset, however, if you purchase a larger, more expensive gun. Plus, the heavier the container, the harder it will be to hold and control it for a long time. Ultimately, the choice is yours to make; after all, you’ll be the one using it! If you have strong hands, budget is your primary concern, or you’re only caulking a small area, choose a basic model. If you prefer using power tools but don’t own an air compressor, go with the battery-operated type. And if you already have a full arsenal of pneumatic tools that you enjoy using, by all means purchase a pneumatic version. Great post!! Thank you very much for sharing this useful information. 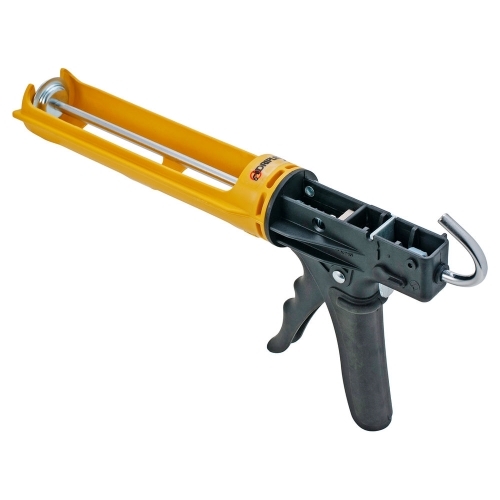 Pneumatic caulking gun is very advantageous for many projects. 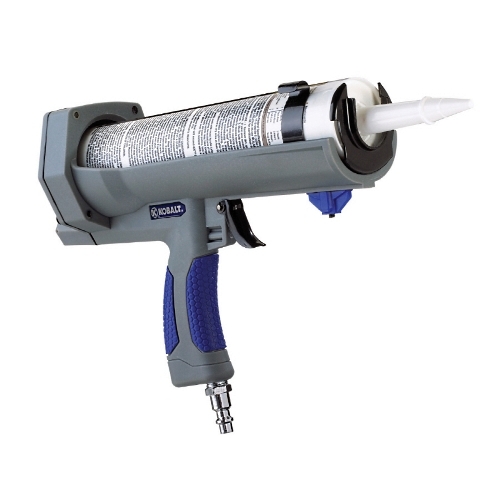 Caulk guns will take standard containers of caulk, so it makes it simple to utilize.